If you go to West Palm Beach, Florida, you’re definitely going to want to get out on the water. Florida water fun is far more than just splashing around at the beach day after day. There are lots of great things to do; but it always pays to plan ahead. All of Florida’s Palm beaches are amazing places to spend some time exploring the wonders of the underwater world. Because the area is close to the warm waters of the Gulf Stream, it is teaming with life and remains warm enough to visit at nearly any time of year. You can dive artificial reefs and shipwrecks or even get your diving certificate if that’s how you’d like to spend your holiday. If you prefer remaining closer to the surface, there are gorgeous snorkeling destinations where you’re likely to see turtles, rays, exotic coral formations, and all kinds of tropical fish. A jet ski rental West Palm Beach style is the perfect way to cruise the coast, run around an island, explore an inlet, or just let off some steam as you speed along as fast as your jet ski will take you. You can go by yourself or rent jet skis that can hold up to three people for a group experience. You can take a picnic out to one of the nearby islands, tour along the coast and see some of the state’s most amazing homes, or look for dolphins in the open water. You never know what you might see while you’re out there. West Palm Beach has some of the greatest fishing spots in America. If you like freshwater fishing, you can fish from shore at Dyer Park, Okeeheelee Park, and Stub Canal Park. There are even more choices in the nearby areas if you’re willing to travel a bit. There is freshwater pier fishing at Okeeheelee Park. If saltwater fishing is your preference, you can fish from shore all over the county so long as you do so outside of designated swimming areas. Try Peanut Island Park and Juno Park. If you prefer to go out onto the water, there are lots of fishing tours available. Head out onto the deep blue sea in a sailing yacht and learn how to harness the power of the winds. See exactly how fast the wind really can take you with a full on sailing regatta. If you prefer the speed and luxury of a yacht, there are plenty you can rent or rent a place on. You can get dinner cruises as well or take day cruise to see sea life or mansions along the coast. You can even rent a seaplane if you’d like to fly out to sea for a while and then land to spend some time in the water. If you enjoy powering a boat with your arms, you’ll find plenty of great kayak, canoe, and paddleboarding opportunities. Kayak tours will introduce you to the most gorgeous secret places West Palm Beach has to offer; or you can rent your own kayak and spend the day exploring. Go up the estuary or into Lake Worth Lagoon. Visit John D. MacArthur Beach State Park. From the vantage point of your kayak or paddle board you’re almost certain to see mullet, dolphin, manatee, and amazing birds. A trip to West Palm Beach wouldn’t be complete without a trip to the beach, but this doesn’t have to be boring. Palm Beach County has some great surfing spots, believe it or not, and you can even get surfing lessons if you want to give it a try for the first time. If views are what you’re after, John D. MacArthur Park is the place for you to get unobstructed views of natural beauty. 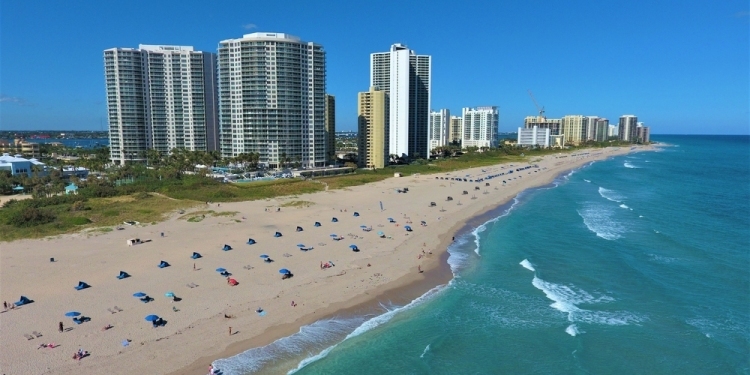 Lake Worth Beach is family-friendly and has plenty of soft sand, experienced lifeguards, and areas for children to play. If you want to bring Fido, check out Juno Beach. Whatever time of year you visit West Palm Beach, there’s fun to be had out on the water. Do your research before you go and book your rentals early. That way once you arrive all you have to worry about is having a great time.